I will begin doing sessions again starting on October 9, but I'm opening up my calendar now to start booking for fall. If you want a session sometime before Christmas, please contact me soon to get on the schedule because I'm limiting how many sessions I will do. 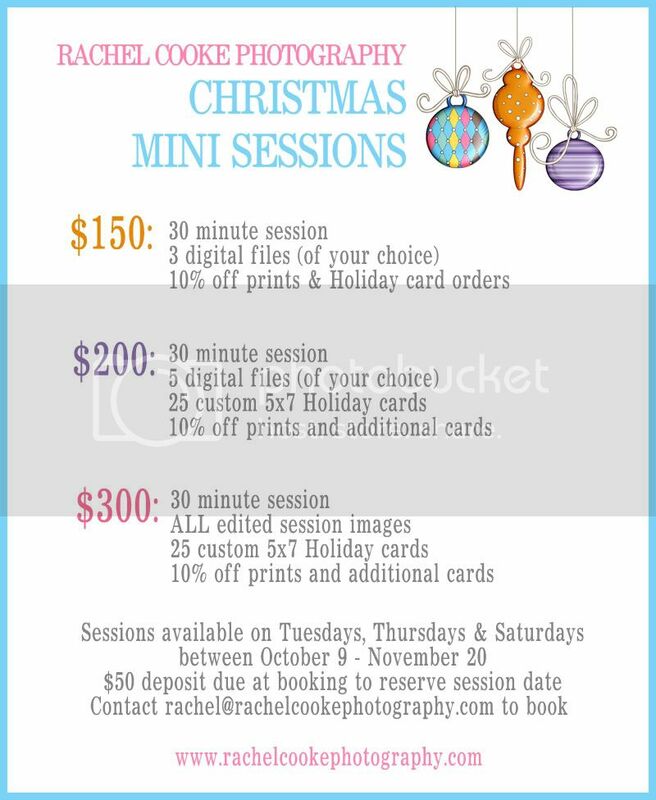 I am booking regular sessions as always, but I am also offering three mini-session packages (see below). When you book, please let me know what kind of session you would like. Christmas card orders will need to be placed by December 1st to make sure they arrive in time to be sent out. I hope to have some Christmas card templates up on the website soon. And print and gift orders need to be placed by December 11 to be sure they are here in time to be wrapped for Christmas! I'm so excited that fall is almost here and I am looking forward to start doing sessions again!